Aren’t red potatoes with greens beautiful? If you think of cardboard when you think of healthy food, then you haven’t had the right kinds of healthy food! Natural foods are full of colors, flavors, and interesting textures. Don’t give up on this journey towards health! I LOVE what I eat, and it’s so much fun to share these recipes and encourage you all!!! The transition towards health can have some rocky areas, but once you trade out your pantry with healthy whole foods you’ll find that it becomes easier and easier to eat this way! Check out my article, called “Example of a Healthy Pantry,” for some helpful pantry ideas. I recently published a post on potatoes, so for now I’ll focus on the health benefits of the greens. One of my favorite food books is “Eat to Live: The Amazing Nutrient-Rich Program for Fast and Sustained Weight Loss ,” by Dr. Fuhrman. I am not a vegan, so I don’t agree with all of his conclusions, but have learned a lot from his perspective! One of the things he says in his book is that even if you don’t make huge changes to your diet, simply adding greens will make a big difference in your overall health! This is because greens are just bursting with healthy nutrients. They basically give your body the building blocks it needs to function well, without adding a ton of calories. Greens provide you with vitamins, minerals, fiber, iron, and phytonutrients. They even have trace amounts of healthy fat and protein in them! I try to add greens to almost every meal. 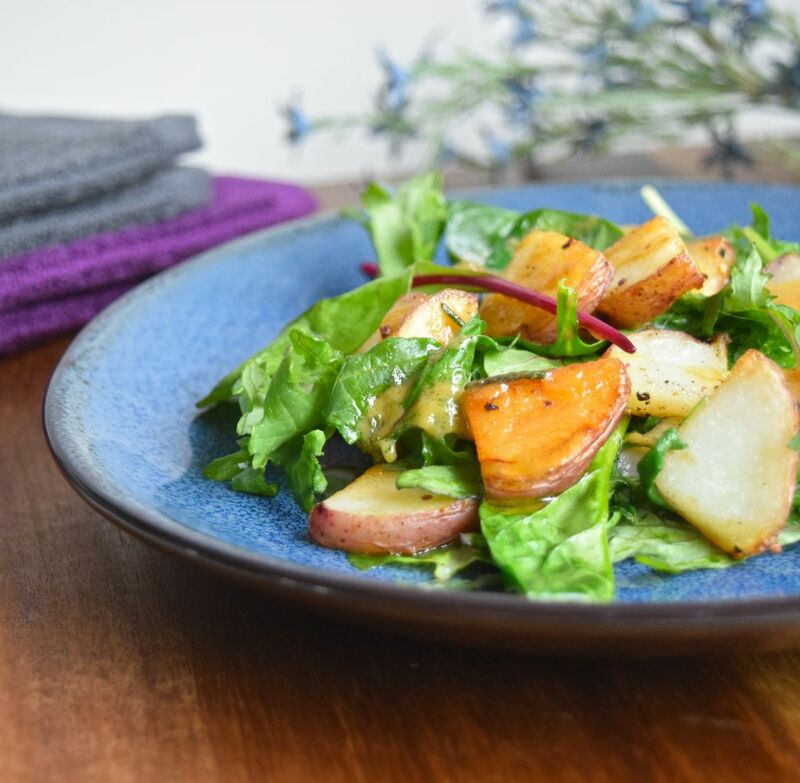 Before we get to the recipe for the Red Potatoes with Greens, I want to invite you to join with others who are making healthy changes. I’d love to walk alongside you in your journey towards wholeness and health! Jesus said, “I have come that they may have life, and have it to the full!” Freedom from food addictions is part of having a truly full life. Melt the coconut oil in a 10 inch cast iron skillet over medium heat. Add the potatoes and sprinkle them with the salt. Cook, using a metal spatula to scrape the bottom of the pan and stir periodically. When the potatoes are soft (not too soft) and light brown, add the greens and turn off the heat. The residual heat should be enough to just barely wilt them. Sprinkle with pistachios and drizzle with honey mustard sauce. Combine all of the ingredients in a Salad Dressing Shaker , and shake until they are well combined. The mixture will be thick. 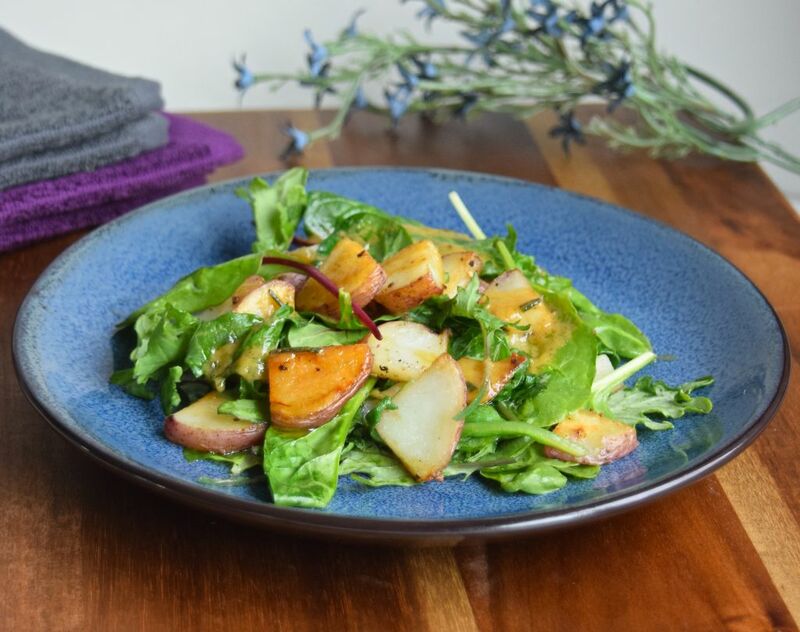 Drizzle it over your red potato and greens mixture right before serving. Enjoy! One Response to "Red Potatoes with Greens and Honey Mustard Sauce"